Stock photo of snow-covered Medicine Lake during Winter along Maligne Lake Road in Jasper National Park in the Canadian Rocky Mountains, Alberta, Canada. 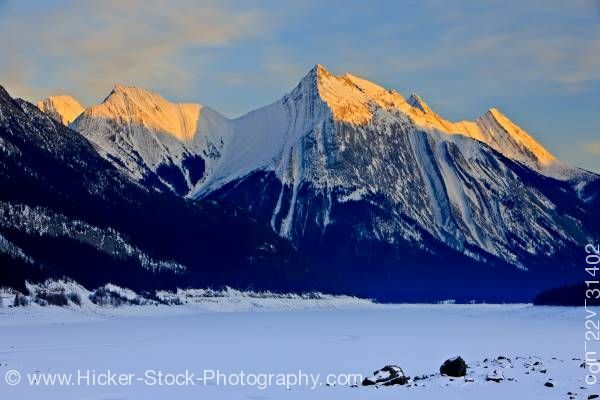 This stock photo includes snow-covered Medicine Lake during Winter along Maligne Lake Road, Jasper National Park, Canadian Rocky Mountains, Alberta, Canada. Jasper National Park forms part of the Canadian Rocky Mountain Parks UNESCO World Heritage Site. Tall snow-capped mountains and sky make up the rest of this winter scene in the Canadian Rockies. Large numbers of elk, bighorn sheep, mule deer and other large animals, as well as their predators make Jasper National Park one of the great protected ecosystems remaining in the Rocky Mountains. This vast wilderness is one of the few remaining places in southern Canada that is home to a full range of carnivores, including grizzly bears, mountain lions, wolves and wolverines.